AND 'SCIENTISTS' AMPUTATED ITS FLIPPER. "...the Fort Bragg blue whale was the second to perish from a collision with a boat this fall and the fifth to die off the California coast this fall...The National Geographic and other media outlets gushed that the Fort Bragg blue whale’s death provided a unique opportunity for scientists to study a whale..In investigating the incident, Noyo News learned that the Pacific Star did not have a valid 'Marine Geophysical Survey Permit,' and lacked the required marine mammal observer at the time of the accident, and so was operating illegally..."
"The presence of that animal on the beach," he said, "is another sign that we're malefactors on this planet." Environmentalists and fishermen on California’s North Coast are calling for an investigation into the killing of an endangered blue whale off Fort Bragg by a mapping survey boat contracted by NOAA’s National Marine Fisheries Service. Environmentalists and fishermen on California’s North Coast are calling for an independent investigation into the killing of an endangered blue whale off Fort Bragg by a mapping survey boat contracted by the National Oceanographic and Atmospheric Administration (NOAA). Jim Milbury, spokesman for NOAA's National Marine Fisheries Service, said the boat was doing multi-beam echo sounder surveys to update marine charts and to determine the habitat to be used in state and federal marine protected area designations. Multibeam echo sounders (MBES), like other sonar systems, transmit sound energy and analyze the return signal (echo) that has bounced off the seafloor or other objects, according to NOAA's Office of Coast Survey. Multibeam sonars emit sound waves from directly beneath a ship's hull to produce fan-shaped coverage of the seafloor. Collisions with boats are relatively infrequent, but the Fort Bragg blue whale was the second to perish from a collision with a boat this fall and the fifth to die off the California coast this fall. On October 12, a 50-foot blue whale was found floating in a kelp bed off Big Sur along the Monterey County coast after an undetermined vessel hit it. Three other whales washed up on southern California beaches in September. As biologists investigate the deaths, ocean advocates blame the U.S. Navy for conducting tests of high-powered sonar devices believed to cause unbearable pain to whales and other ocean mammals. The National Geographic and other media outlets gushed that the Fort Bragg blue whale’s death provided a unique opportunity for scientists to study a whale. However, fishermen, environmentalists and seaweed harvesters are outraged that the vessel, conducting surveys designed to designate habitat to be included in no-fishing zones that will kick Indian Tribes, fishermen and seaweed harvesters off their traditional areas, was negligent in trying to avoid a collision with the whale. Many believe that the sonar beams coming from the boat may have disoriented the whale, causing it to collide with the boat. Blue whales are the largest mammals on Earth and possibly the largest animals ever, according to the American Cetacean Society Web site, http://www.acsonline.org. Fearing the endangered animals could soon become extinct, the International Whaling Commission banned all hunting of blue whales in 1966. There are now an estimated 3,000 to 4,000 blue whales in the Northern Hemisphere. The longest known blue whale measured 106 feet long and 200 tons. Whales are an average life span of 80 to 90 years. David Gurney, in his article on the Ocean Protection Coalition website (http://www.oceanprotection.org), demanded a full and independent investigation of the incident. 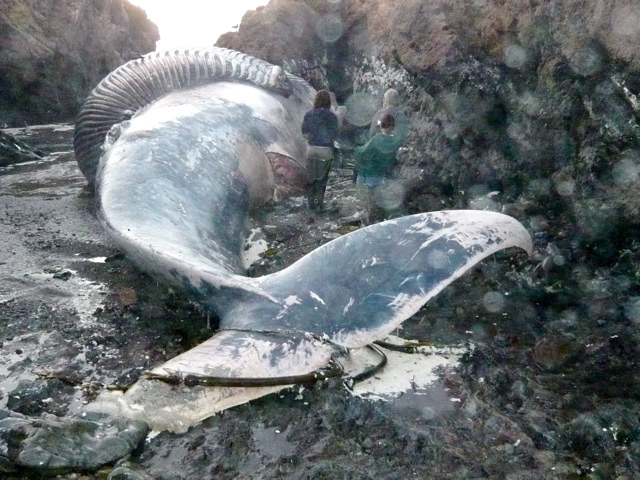 Local environmentalists and fishermen have decided to name the dead whale "Jane" after Jane Lubchenko, the NOAA administrator who is running the federal fishery “management” scheme that resulted in the whale's death. The RFA, Ocean Protection Coalition and other conservation groups have asked for a suspension of Republican Governor Arnold Schwarzenegger's fast-track MLPA process, due to lack of dedicated funding, numerous conflicts of interests by MLPA decision makers and the lack of clarity about what type of activities are allowed in reserves. This tragic incident only highlights the urgent need to suspend the corrupt and out-of-control MLPA corporate greenwashing process that is opposed by the vast majority of North Coast residents. Among the communities of the North Coast dramatically impacted by the corrupt MLPA process is the Kashia Pomo Tribe, who have sustainably harvested seaweed, mussels and abalone off Stewarts Point for centuries. However, the California Fish and Game Commission in August, under orders from Governor Arnold Schwarzeneger, banned the Kashia Tribe, seaweed harvesters, fishermen and abalone divers from their traditional harvesting areas in Sonoma and Mendocino counties. Everybody who cares about the health of our oceans and coastal communities should support a full, independent and impartial investigation of the killing of "Jane " the whale by a NOAA contract boat. At the same time, the MLPA process, rife with conflict of interests, mission creep and corruption of the democratic process, should be immediately suspended. "How ironic it is that a rare blue whale was killed by the people who say they want to 'protect marine life,'" concluded Martin. Environmentalists and fishermen on California’s North Coast are calling for an independent investigation into the killing of an endangered blue whale off Fort Bragg by a mapping survey boat contracted by NOAA’s National Marine Fisheries Service. In order to stop the killing of any more whales, locals are also asking for an immediate suspension of the Marine Life Protection Act (MLPA) process that the boat was collecting habitat data for. Jim Milbury, spokesman for the National Marine Fisheries Service, said the boat was doing multi-sonar beam surveys to update marine charts and to determine the habitat to be used in state and federal marine protected area designations. Collisions with boats are relatively infrequent, but the Fort Bragg blue whale was the second to perish from a collision with a boat this fall. On October 9, a 50-foot blue whale was found floating in a kelp bed off Big Sur along the Monterey County coast after an undetermined vessel hit it. On Oct. 19, 2009 an underwater mapping vessel on its last day of work for the Marine Life Protection Act Initiative (MLPAI) struck and killed a 72-foot female blue whale. The MLPAI ‘Initiaitive” denied any responsibily for the accident, and shifted blame to NOAA as the contracting agency. 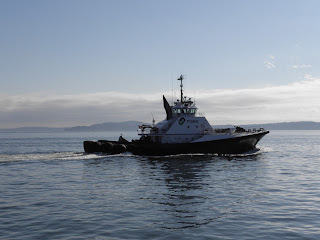 However, it was later learned that the primary mission of the research vessel Pacific Star – was to gather data for California Seafloor Mapping Project (CSMP) – to be used in designing California’s marine protected areas. 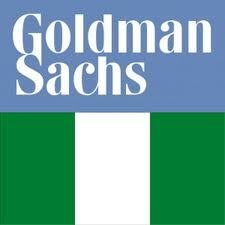 The project was heavily funded by the Packard Foundation, the major financier of the MLPAI “Initiative.” The Packard Foundation has since removed its name from the CSMP website. In investigating the incident, Noyo News learned that the Pacific Star did not have a valid “Marine Geophysical Survey Permit,” and lacked the required marine mammal observer at the time of the accident, and so was operating illegally. On November 18, 2009, I travelled to Eureka, CA to provide public comment before the MLPAI’s “Blue Ribbon Task Force” (BRTF) – to ask for an independent investigation of the whale strike incident. As I was speaking, Executive Director Ken Wiseman interrupted me at two minutes, one-minute before the previously announced three-minute public comment time period had expired. Although I asked to finish my short statement, and tried to read the last two sentences, Mr. Wiseman quickly cut the microphone and ordered three California Fish and Game Wardens to remove me from the podium. After I had been removed, Wiseman, and program manager Melissa Miller-Henson, went on for several minutes, explaining how the MLPAI was not at all culpable in the death of the blue whale. Ron LeValley showed up three days after the Oct 19, 2009 whale strike at the site where the dead animal was beached, in a very tight narrow cove about a mile south of Fort Bragg. I was also there. 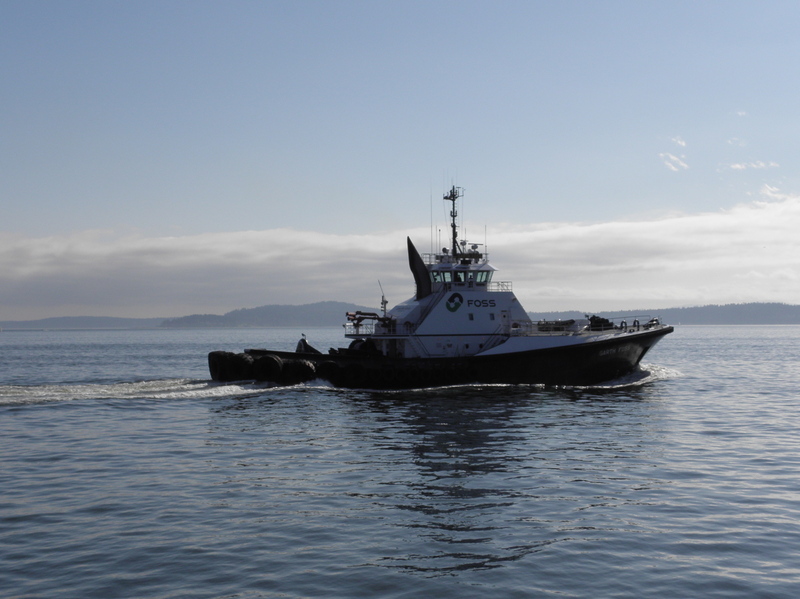 When questions were raised during those first few days about how the accident had occurred, it was established that the vessel Pacific Star was using side-scan and multi-beam sonar for hydrographic surveys. At the scene, Ron proclaimed himself a “whale expert” and started making very public and adamant statements – to the press and anyone who would listen – that the vessel’s hydrographic sonar had nothing to do with the whale strike. He claimed it was the same type of sonar that fishing boats use, that sonar only affects toothed whales, not baleen whales, that it was just a freak accident, and the ships powerful mapping sonar had nothing to do with it. He presented a public slide show on whales in the following weeks, where he expressed these beliefs, and claimed that a whale feeding on plankton is no smarter than a cow grazing on grass. This had many people’s heads scratching. Why would a trained biologist make statements that fly in the face of fact? To even do hydrographic surveys in California waters, you are required to have a special permit, costing $5,000, that regulates sonar surveys – specifically for the protection of marine mammals, who are definitely adversely affected by sonar. As a biologist and whale expert, Mr. LeValley certainly must have known this. It was later learned that the Pacific Star did not possess a valid “Marine Geophysical Survey Permit” at the time of the accident, nor were they operating under the terms of the permit, which requires a lookout at all times (a “marine mammal observer”). 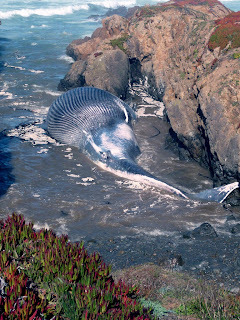 When apprised of this, Mr. LeValley went on to claim at that this also didn’t matter, that the accident would have happened anyway, and that because of the way blue whales surface unexpectedly, an observer wouldn’t have seen her. This also is contrary to the opinion of real whale experts, and to the fact that an observer doing their job would have noticed the whale, and made the captain and crew aware of her presence. Going back to a few days after the accident – The property owners’ had to figure out what to do with an extremely foul smelling carcass that would have made life unbearable. It would have been logical to attach long cables at high tide, and tow her back out to sea. But Mr. LeValley assured the headland property owners that he could secure funding to haul the beast up the cliffs, by helicopter if necessary, to remove the carcass and bury the bones until the microbes ate them clean. This was done. A large crew of volunteers and paid workers, including a couple of heavy equipment operators, worked for almost two weeks, pulling macabre slabs of rotting flesh and bloody bones up the cliff. The bones were buried at a secret location in the woods east of Fort Bragg. Why the cover-up? And who paid for it? Some speculate that the private billionaire sponsors of the MLPAI (shielded by the Resources Legacy Fund Foundation) knew they had a public relations nightmare on their hands when their mapping vessel killed the whale. LeValley may have been their point man, to ameliorate the situation as best he could, and avoid any bad publicity. Whether this is true or not remains to be seen. But two months after the accident, Mr. LeValley was chosen as a Co-Chair for the North Coast “Science Advisory Team” for the MLPAI. Although officially chosen for his extensive and well-respected knowledge on birds, he had been a strong advocate for the marine closures to fishing and gathering by the corrupt, privately sponsored MLPA Initiative, both before, during and after the whale strike incident. Blue Whale Beached: Flipper to be Amputated? 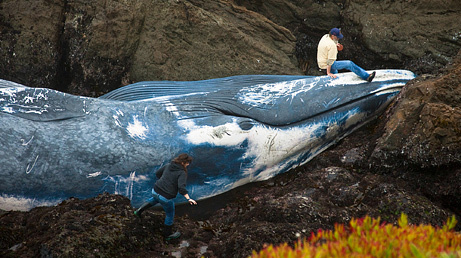 October 22, 2009—The apparent victim of a ship collision, a dead 70-foot (20-meter) blue whale (pictured) washed ashore in a forbidding northern California cove this week. Though unable to move the blue whale, scientists and students are leaping at the research opportunity, scrambling down rock faces to take tissue samples and eventually one of the 11-foot-long (3.5-meter-long) flippers. Though relatively infrequent off California until recent years, ship collisions are "the number one human threat to blue whales," according to marine biologist Joe Cordaro of the U.S. National Marine Fisheries Service. This week's collision, he said, marks the second time this year that a ship off California has fatally wounded a blue whale. The world's largest animals, blue whales can grow to about a hundred feet (30 meters) long—about the length of a space shuttle. Listed as endangered by the International Union for Conservation of Nature, the whales are said to face a very high risk of extinction in the wild, largely due to heavy hunting prior to a 1966 ban. On Monday, Cordaro received a report from a ship mapping the seafloor for the fisheries service. The researchers had "felt a shudder underneath the ship" about 7 miles (11 kilometers) from shore. Soon after, a whale surfaced, bleeding profusely, Cordaro said. Several hours later, the beached blue whale was spotted near the city of Fort Bragg. Given the evidence—timing, location, a fresh propeller wound—Cordaro said, "I don't think there's any doubt" that the mapping ship is the culprit. "I'm as sorry as anybody that that animal perished," said Humboldt State Universitymammologist Thor Holmes (pictured above atop the whale). But to find "a fresh, female blue whale in a place that's accessible—that is amazing." On Tuesday, Holmes and two students drove several hours to study the blue whale. After he'd scrambled down the "scary" rock faces, he told the eager students to stay put for their own safety. "Man, I knew from the looks on their faces there was an insurrection brewing," he said. The others eventually found another, wetter way around. On the shore, the researchers took blubber samples, which Holmes expects will shed light on the whale's pre-collision health. "Just the fact that the whale has a good, thick blubber layer," he said, "shows it was a really, really healthy animal." The blue whale will be left on the Fort Bragg beach, the National Marine Fisheries Service's Cordaro said. Given the cove's inaccessibility to vehicles, he added, "That whale ain't going anywhere." But researchers are planning more tests, including an amputation of one of the blue whale's flippers this week—a potential windfall for an ongoing Humboldt State study comparing the limbs of cetaceans, which include whales, dolphins, and porpoises. The university is also sending more students to examine the rare specimen, and a dermatologist at Humboldt is hoping to secure hair follicles for study. For Holmes, the specimen holds great scientific promise, but also serves as a painful reminder of humanity's role in the blue whale's rarity.